Today Microsoft added Vanquish, SEGA and PlatinumGames action shooting game to their Games on Demand service on Xbox Live, joining many other notable SEGA titles, such as Bayonetta, Virtua Fighter 5 and Sonic & SEGA All-Stars Racing. This allows one to purchase the full game directly for download to keep on their HDD. At $40 USD, this is the most expensive SEGA game available on there. Be sure to read our review to help make your purchase. The latest trailer for Vanquish reveals just a handful of the robotic Russian forces you will face and some of the ways you will be able to defeat them. Some new areas as well as abilities are shown, but only for short periods of time. 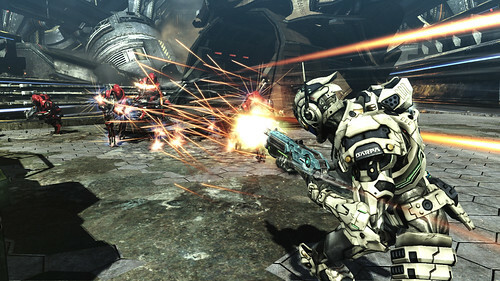 Vanquish is the latest PlatinumGames release with SEGA on the Xbox 360 and PlayStation 3 and is set to arrive on late October. A limited edition of Vanquish surfaced on the website of UK based retailer Zavvi. This limited edition, pictured above, features a figurine of the protagonist Sam as well as a copy of the game, encased in a special box. Both versions, Xbox 360 and PlayStation 3, will receive the limited edition. The retailer claims this edition is exclusive to their shop. While Zavvi is based in the United Kingdom, the company will deliver worldwide. This edition costs £54.95 or €67.45, depending on the currency of choice, plus delivery charges. A new trailer featuring the story of Vanquish has been released. San Francisco comes under attack by a metrosexual Russian and his space armada, and the President of the United States refuses to negotiate with him. This leads to conflict as America must send all of it’s armed forces to defeat this threat and secure victory. During this conflict there is no time for regrets as the rules of engagement have been broken; that is unless you hit hard, as that would make them regret it. 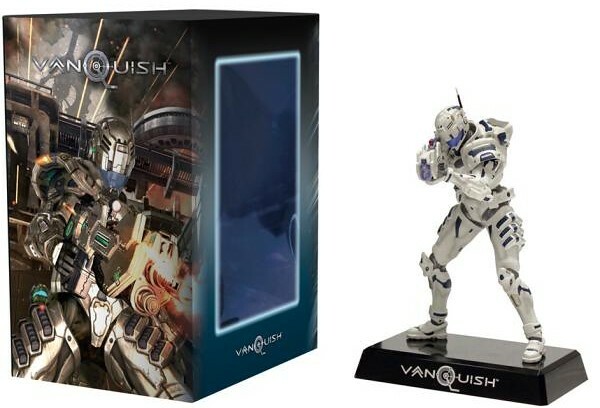 The demo for SEGA and PlatinumGames newest 3D action title Vanquish is available for free download now on the Xbox Live Marketplace for the Xbox 360 and the PlayStation Network for PlayStation 3. The Xbox 360 demo is only for Xbox Live Gold members, but it can be added to your queue on Xbox.com. The newest trailer for Vanquish shows what the first set of downloadable content that is featured in the game. Those of you who pre-order now at GameStop and a few other outlets will get a download code that unlocks all of the weapons featured in the video above. 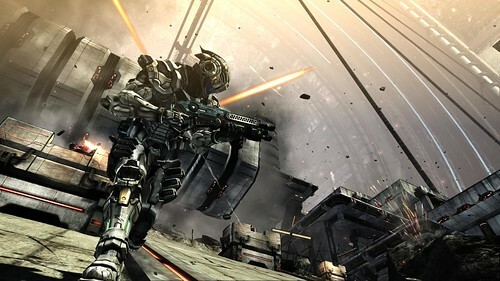 Vanquish is PlatinumGames’ latest game for the Xbox 360 and PlayStation 3 and is expected to be released late October in all regions, with a demo arriving just a few days before. The Laser Cannon, Anti-Armor Pistol, and Boost Machine Gun will also be purchasable on the Xbox Live Marketplace and PlayStation Network if you do not pre-order.